Germinator, Creat Studios’ 20th title for Sony’s PlayStation® Network, provides a character-styled departure from the usual bubble-popping casual games. Dismiss traditional match-3 for combining germ bubble characters of the same color. Timing and accuracy are required to prevent germs from rising too high and overtaking the house. New Twist on Bubble Popping. No more old achool match 3. 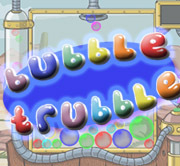 Crash your germ bubbles into those of the same color until they POP... gooey, splotchy, splattering pops. Crazy Cast of Characters. 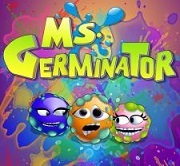 Germinator features a crazy cast of multi-colored bubble germs with their own personalities and traits. Local Multiplayer. Battle your friends to ahow who can really clean house, or play against the AI. Move Support and more. Full support for the Sony PlayStation Move controller. OVer 200 levels provide hours of challenge for casual and expert gamers alike.